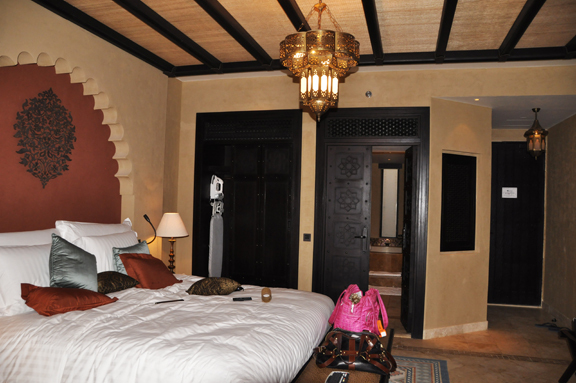 This weekend I toddled off for a quick trip to Anantara’s Qasr al Sarab resort in Abu Dhabi’s Liwa desert. 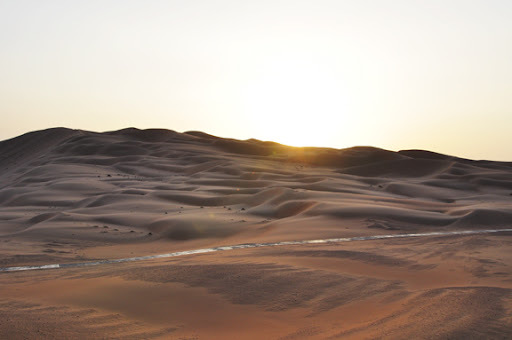 Liwa is a part of one of the world’s largest sand deserts, the Empty Quarter (Rub’ al Khali). The resort is a good three hour’s drive from Dubai, the final hour and a half being pretty much one (very boring) straight-shot away from the gulf and into the desert towards the border of Saudi Arabia. 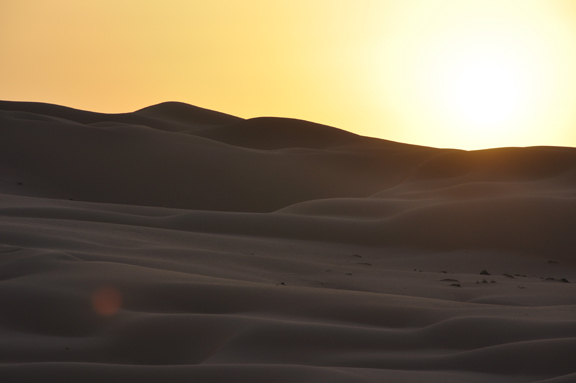 The further you drive, the more impressive the desert around you becomes, with the dunes gaining in size. Beyond the resort a bit you’ll actually find one of the largest dunes in the world, called Moreeb Dune, which is around 300 meters/990 feet in height (to compare, the large dune next to this resort which you can see in pics below is only 200 feet). I didn’t get to make it there during this trip, but am counting on it some other time. Finally you make it to the turn-off to the resort, which is 10-12 kilometers of just sandy, gravely, unpaved road. it’s not bad, you can do it without a 4×4 (I just have a lil Mercedes C230 hatchback) and you’ll feel every bump but you’ll make it there in the end (after about 30 minutes of careful maneuvering). This is where the landscape really starts to become awesome, as you’re driving right through the massive dunes. …Except for the one part where you drive past a huge cement or gravel (?) factory which was a bit of a moment ruiner. The resort itself was pretty predictable 5-star fare all around; what really makes it stand out is its location scenery. 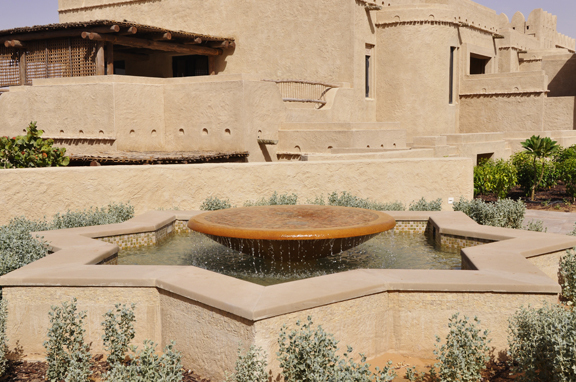 Qasr al Sarab is, not surprisingly, done up in Bedouin/Arabian style with the exception of the water features everywhere. You can not really go anywhere on this massive resort without hearing water flowing, take that how you will. Relaxing, wasteful, opulent, a relief in case everyone turns into zombies and for some reason you can’t get away in your car but at least you have water everywhere to survive on in this wasteland – you decide, but I was definitely thinking the latter. Much like the grounds, the room was predictably 5-star nice. 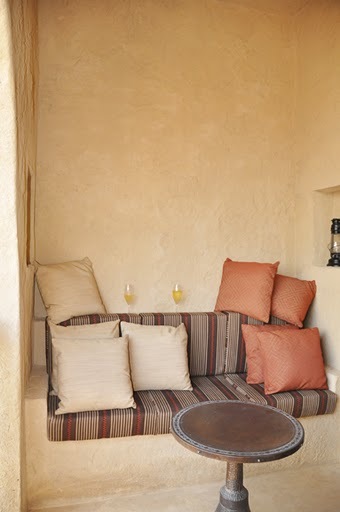 The balcony was lovely, with comfortable cushioned seating and a really incredible view, especially during the sunset. The bathroom also came equipped with one of the largest bath tubs I have ever personally come across (it took a good 45 minutes to fill up). Again with the water! Much like Anantara’s other Abu Dhabi resort on Sir Bani Yas island, I also found the lighting here to be a bit bizarre. They don’t use simply light switches like most homes and hotels but have settings labeled things like, “welcome”, “play”, “rest”, and “sunset” which I just thought was a bit odd. 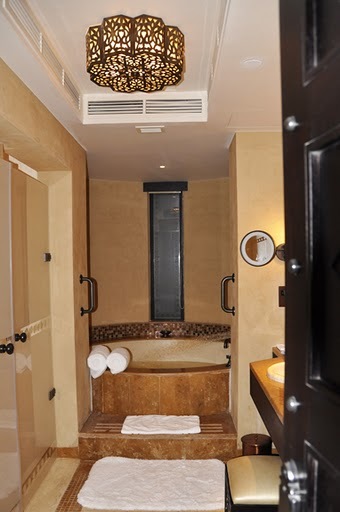 Qasr al Sarab also has a few activities on offer to help you experience the surroundings. You can go out in a 4×4 for some dune bashing, take a camel ride around the dunes, mountain bike or even go on a guided walking trek. As our stay here was short (and it was extremely hot) we didn’t take advantage of any of the guided activities but decided to stroll up the dunes in the immediate area ourselves. I’m not hugely keen to return to Qasr al Sarab any time soon. Apart from the location, which was stunning, the resort itself isn’t anything particularly special. Even the activities aren’t unique, you can easily do anything there anywhere else in a much shorter drive from Abu Dhabi or Dubai (although admittedly in locations not so stunning). It was also a really very large resort and I much prefer to stay at smaller places with less people for maximum peace and privacy. There were a lot of families with kids here. Kids are not my thing. I don’t know if this resort attracts more family-types or if it was just a coincidence, but it was what it was. I would recommend Anantara’s Desert Island resort on Sir Bani Yas island before this one, which I visited directly after it opened in November of 2008. The resort is much smaller (maybe a quarter or third of the size?) and it’s on a private island which is also an animal reserve (cheetahs, giraffes, oryx, gazelles, hyenas, etc…) and in my option, far more interesting. Game safaris, snorkeling, kayaking through mangroves, I really want to make a return trip to this resort sooner than later. The drive home, which should have taken around around 3 hours ended up being something of a nightmare. Shortly after leaving the resort and the very (very) small town in the vicinity, my car’s engine overheated as it had run out of coolant. We were extremely far from the next petrol station (~100km?) and had little choice but to very (very) slowly and carefully (and without aircon) as to not overheat the engine, continue down the road towards a restaurant which we had recalled passing on the way in. A couple hours later (when we should have been back in Dubai) the restaurant appeared and we were able to cool the engine down with some water. I had also called AAA (Arabian Automobile Association) a while earlier and not too long after the restaurant they finally got to me with a huge jug of coolant. Getting stranded in an endless, inhospitable desert in the middle of summer are the things nightmares are made of, but it ended OK. I don’t know what the outside temp was there, but considering it’s usually hotter in the desert than it is on the shore, and the shore has been at around 105 lately, I’d put a conservative guess at 110-115 degrees F. Lesson here? Don’t ever drive into the middle of nowhere without a massive supply of water and coolant.